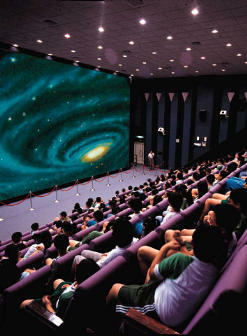 The 3D Theater uses two Christie Projectors and the different filtering directions of light properties for polarizing filter to form 3D visual images. There are 208 seats in the theater, combining with careful planning of silver, wide screen, and the visual enjoyment of advanced stereos. When the audience puts on the 3D glasses, they will immediately perceive that the characters from the scenes of films appear next to you and the living 3D sensory effects give you a seemingly real immersion of the scenes.